Tuesday morning, I waded through miles of wreaths, reindeer, and ribbon at the store searching for a craft to bring to a friend's house for today's Feast of St. Nicholas. Perhaps the suave rhythms of "Chestnuts Roasting on an Open Fire" taken with the mechanical sway of a dozen dancing snowmen combined to form a Pepsi-Mentos reaction in my brain, but it seemed as if all inspiration and creativity had fled, leaving behind an empty shell of a woman, winding her way round the aisles muttering incoherently about "tiny tots with their eyes all aglow" and "folks dressed up like eskimos." Just as I was about to take my first delirious swing at Jack Frost nipping at my nose, I remembered once again to look to the Babe in the Manger for inspiration. 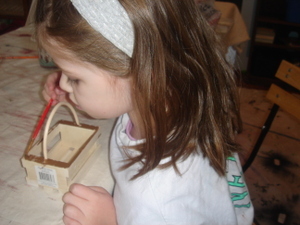 We started with unpainted wooden farm baskets. 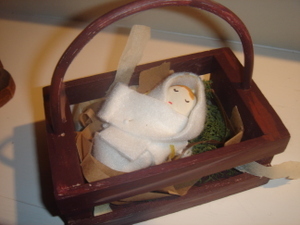 The faces were drawn on with markers, and you will note that the manger baskets are lined with a combination of shredded yellow tissue, brown paper bag strips, and green moss. Straw or raffia would be even more attractive, but I did not want the little bits of straw to wreck my friend's house. Besides, I thought it might be interesting to have the option of writing sacrifices on the strips of paper as they are completed during Advent. 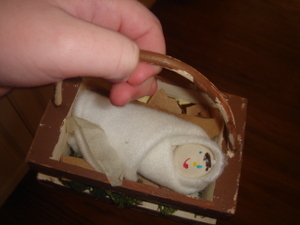 The children loved toting their own mangers around today, promising to hide them away at home until the glorious Feast of Our Lord's Birth. 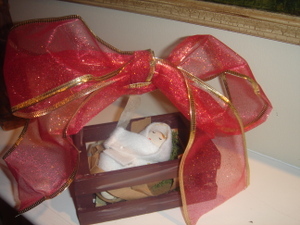 So there you have it--Take Along Mangers, a craft to complete during Advent or save for the 12 Days of Christmas. And so I'm offering this simple phrase, to kids from one to ninety-two . . . . Agh, not again! May you and your family continue to have a Blessed Advent! 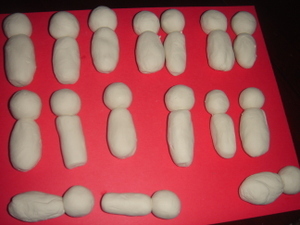 Important note: When creating this craft with young children, please omit the pearl-head pins in favor of tacky glue. Absolutely gorgeous (as usual)! These will definitely "help to make the season bright." I love this craft, Alice. My daughter will as well. Thank you! Perfect for our craft today. Thanks so much, Alice. Beautiful! I'm adding this to my December craft folder. Oh this is one of my favorite ideas yet! How cute! hehe...I knew before I finished the first paragraph it was one of Alice's posts. A large wooden bead would work for the baby head also; just thinking about it since I have those on hand. Very Cute! I love this project --- thanks so much for the inspiration! I know both of our children will love this! 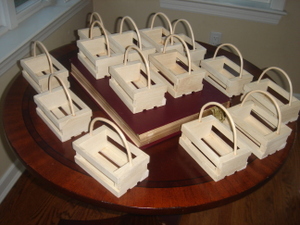 We are planning to do this for our Advent Night, but we are having trouble finding the farm baskets. Can you please tell me where you got them? Many thanks!